I love a deco toilet block. This little beauty is in the San Francsico Maritime National Historical Park. The bands of wave motifs are perfect for a setting on the bay. 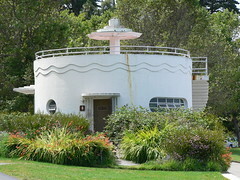 The maritime theme is continued with the small porthole window and the railed viewing deck on the roof. The door is set back into the circular wall with a small porch. It could be a front door to a country cottage complete with flowering garden. The Baths, Middle Brighton have a long and interesting history. They were originally opened in 1881 but were effectively wrecked during a storm in 1934. 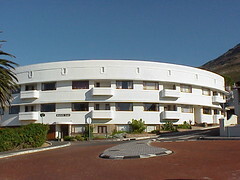 Architects, Oakley & Parkes, designed a moderne streamline building which was opened in the summer of 1936. Then in 1988, the baths received another makeover to take them into the 21st Century which added some modern glass-enclosed spaces to the pavillion while still preserving the original look of Oakley & Parkes' work. I think this is another great example of how older buildings can be adapted for modern requirements. 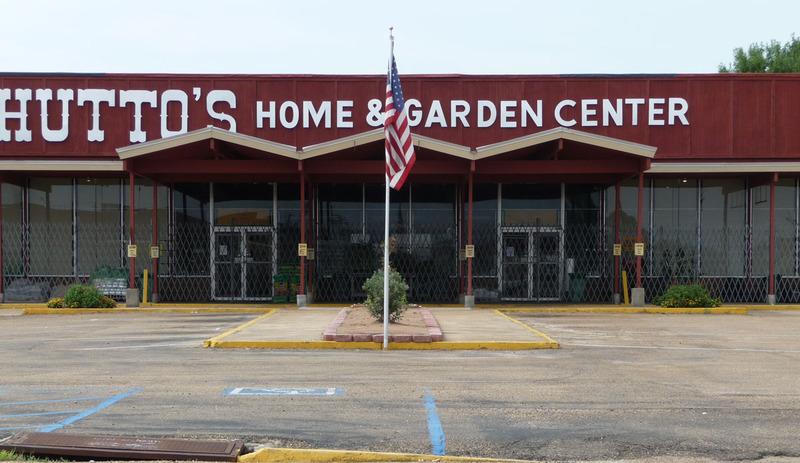 In this case the building has retained it's original purpose. It is clear to anyone looking at the structure which parts date from the 1930s and which parts date from the 1980s. 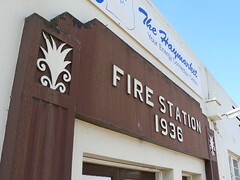 The 1936 Fire Station in the Victorian country town of Creswick at first glace is little more than a square box but closer inspection revels some simple but elegant decoration. Notice the series of horizontal lines on each side of the facade near the roofline. Aptly displaying the rule of three common to so many art deco features, they shorten as they get closer to the ground. 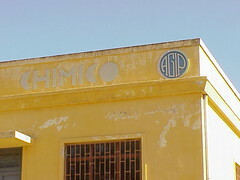 Lettering in the dark brown surround to the entrance bears the name and year. Simple ribbed columns are topped with floral motifs while the whole element is stepped above the doorway. 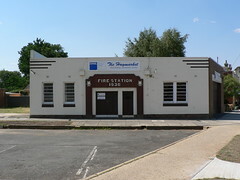 These days the Creswick Fire Brigade, which has been serving their community since 1854, has a new fire station which opened in 2005 but it is good to see the old building has found a new use as The Haymarket, a gas retailer. Update: Thanks to drewsel from the wonderful Bernice Bobs Her Hair blog, who has let me know that the Creswick Fire Station is now being used as a Post Office. 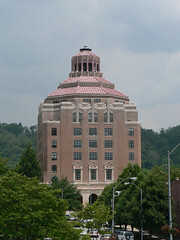 The City Building in Asheville was designed by Douglas Ellington in the mid-1920s. It is constructed from pick marble and brick while the tower on top features blue, yellow and green terracotta tiles. Ellington also designed a matching County Building but was not given the commission to complete the project. In a way it is a shame but maybe two such buildings would be too much ... nah ... I didn't think anyone would buy that one. 2008 is the 60th anniversary of Australian produced Holden cars. 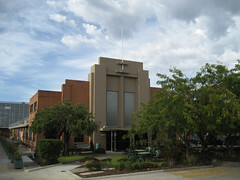 The FX Holden was launched by Prime Minister Ben Chifley in November 1948 at the Social Centre (shown above) at the General Motors Holden plant at Fishermen's Bend in Port Melbourne. The building was probably built in the 1940s in time for this launch. The facade consists of stepped formation of red brick with a further stepped rendered central section. This central section includes large sections of glass bricks and a flagpole. 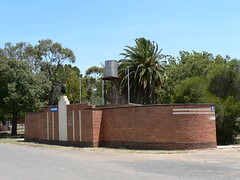 Over the years the Social Centre has hosted concerts, balls and all manner of functions. It has a beautiful parquetry floor just made for dancing. In recent times it has served as the canteen for the GMH plant with deco-style boards listing the menu for the day. This day in 1996 you could have French Onion soup for 70c, Beef Stroganoff for $3.50 and assorted Sweets for 70c and $2.00. Interesting the Stroganoff is described, American-style, as an 'Entree' rather than a 'Main' as would be usual in Australia. 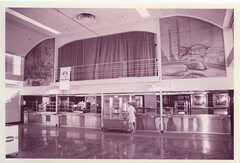 An oustanding feature of the Social Centre is the murals on either side of the stage above the food service area. One depicts all manner of transport from the past. Bullocks, a horse drwn stagecoach, a stream train and a sailing ship. Even an early car makes an appearance. 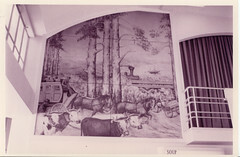 The murals were the work of GMH employee, Eileen Robertson. It is said she worked on them in the tower of the nearby Administration Building and they were installed in the Social Centre whne they were completed. It is also said that she wasn't invited to the launch of the FX Holden in 1948 so arguable she didn't get to see her work at it's finest moment. 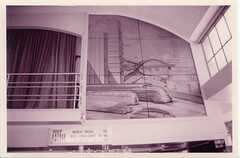 For Art Deco fans the second mural is a beauty. Depicted as a Metropolis-style city of the future, it shows us the extreme streamline transport of super-fast trains, buses, cars and airships of the world to come. I've loved it from the first day (and only day) I saw it. Eileen Robertson may have missed that party in 1948 but her work is still fresh and futuristic 60 years on. I have aconnection with the Albert Park Hotel. I had my wedding reception there. We were married in the nearby gardens and the pub was a good choice for our modest wedding party. I think everyone had a great day. They could order whatever they wanted from the delicious seafood menu and had access to a full range of drinks from the bar. Naturally it helps that we picked up the tab at the end of the day. Of course I like the Albert Park Hotel because it has a somewhat stark modernist exterior. Like so many pubs in the area it was established in the 1880s and recieved a make-over in the 1930s. And now in the 21st Century they also have a very slick website. 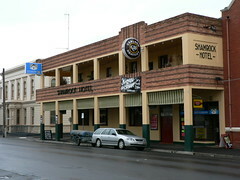 The Shamrock Hotel in Kyneton has a wonderful Art Deco brick facade. A second storey balcony provides a verandah over the footpath. The brick of the balcony and it's roof contrast nicely with the cream render on the supporting columns. The end is also rendered and bears the name of the pub. Above the doorway, the roofline steps up and this part of the brickwork is decorated with several vertical lines of darker bricks. Elsewhere, the decoration consists of horizontal lines of darker coloured bricks. At the side street, to the left in the above photo, the building curves around the corner adding another deco feature to this elegant building. Today saw the inaugural Melbourne Open House. Based on the successful annual event in London, the Melbounre Open House featured 8 buildings within easy access of Fed square. Judging from the queues waiting the see most of the buildings, it was a great success. I queued for 90 mins to get into the Manchester Unity Building but it was worth it. Firstly we were taken to the roof terrace where we had great views over the Melbourne skyline and the tower of the building itself. Manchester Unity was designed by Marcus Barlow in 1929-32 and takes it's inspiration from Raymond Hood's Chicago Tribune Building. The highlight was the Boardroom housing a huge table, the largest in Australia, topped with a thick sheet of Lalique glass. Next I went to the Plaza Ballroom, beneath the Regent Theatre in Collins St. It is a large space so there was no queuing to see this amazing space. It dates from around 1929 by Cedric H Ballantyne but is not a style that I particularily like. Too ornate. I can appreciate it for what it is. The colours on the ceiling are incredible but it doesn't excite me like other buildings of this period. Finally, I headed over to the Capitol Theatre, now owned by the RMIT University. Walter Burley & Marion Mahoney Griffin's 'crystal cavern' dating from 1921-24. 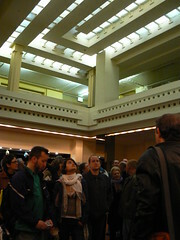 In the foyer and canterlevered canopy over the street, it is a triumph of the square but inside the main auditorium it is a mass of geometric triangles and spikes. Originally light by thousands of coloured lights it is rare to see it lit up these days. It wasn't lit today but it is still a very impressive space. I'm looking forward to a bigger and better Melbourne Open House in 2009. In March 2003, London Time Out magazine produced an Art Deco issue to coincide with the Art Deco 1910-1939 Exhibition at the V & A. 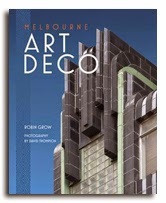 The feature was a small booklet feature the Deco 100 which described Neville House as 'admittedly undistinguished 1930s apartment block'. 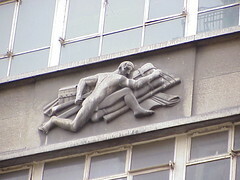 In fact the only reason that Neville House was mentioned was because of the Paviours Arms, a deco pub on the ground floor. Back in 2003, the owners of the building had planning permission to redevelop (demolish) the site to provide 93 modern flats and 2 shop. 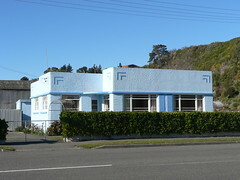 By all accounts the pub was a deco gem but it wasn't open when I visited. And Neville House? 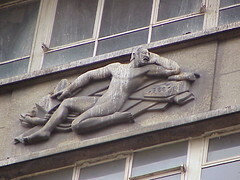 I can't actually remember the building but it did have this series of reliefs on the facade. I presume Neville House, the Paviours Arms and the reiefs have all gone now. I wonder did the built something good to replace them. The thing that stands out to me on this Fire Station on the Lisburn Road in Belfast is the rendered arc joining the two small windows on the central part of the facade. It is echoed in the cicular segments above each of the small window on the set-back wings of the building. It is hard to tell in the photo but there is a chequer-board effect in the brick work on the wings. 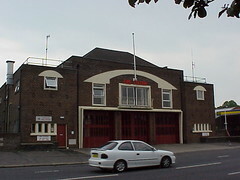 The flagpole and the stepped parapet partially hiding the pitched roof round off the deco features. Previously I've written about the fabulous Maryborough Municipal Olympic Pool but in nearby Prince's Park there is an Art Deco toilet block. 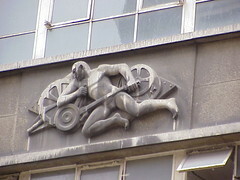 A deco dunny. Bathrooms are often the source of some great deco features in buildings and it is not unusual to see hoards of people of either gender snapping photos of some fitting or other while on a deco tour. The Gents at Prince's Park in Maryborough is a bit different. 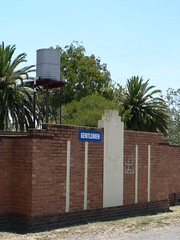 It is an outdoor toilet block at a sporting ground. The interior is very functional and efficient. The exterior is all decoration. The block is symetrical with curved ends hiding the entrances from general view. They are marked with two inset speedlines and, nowadays, modern signage. The middle part of the block is stepped with a central rendered section which is stepped even further. Two vertical lines on either side complete the simple decoration. The entire block is grounded with several rows of darker bricks. 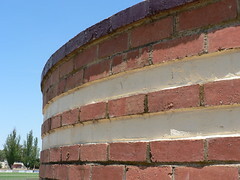 This is echoed with a single row of dark bricks along the top of the wall, projecting into the raised central section. An excellent example of how a careful use of brick can have a striking effect. I wonder if the gentlemen of Maryborough realise they are visiting an Art Deco gem when the take a break during quarter time at the footy. 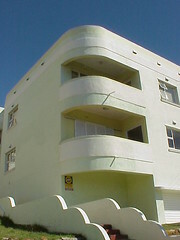 This block of flats in the Cape Town suburb of Vredehoek is called Victory. They date from 1941 by architect J. Bylsma. The building is three storeys tall with a row of garages on the ground level. It is curved at each end with open balconies. My favourite feature is the low walls either side of the steps leading up beside the building. 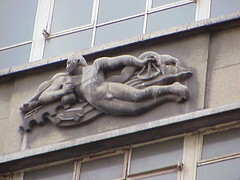 The Hotel Monico was opened in 1938 as a luxury hotel for British holiday-makers. Local businessman, Mr. A H Beaumont had it built next to his amusement park, The Casino. The Casino has now been demolished but the Monico still remains. The hotel is located on a major street corner near the seafront to the Thames Estuary. The main structure is semi-circular with small towers at each end. 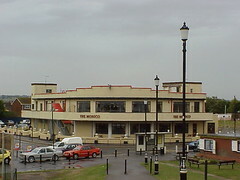 www.canveyisland.org.uk has many clippings and photo relating to both the Monico and the Casino courtesy of the Swann Family who worked at both establishments. At the turn of the 20th Century, Fishermen's Bend in Port Melbourne was little more than a wasteland sandy marshy land. There were some small dairy farms, fisherman's huts, an airfield and rifle butts. In 1903 the Victoria Golf Club was established on the Bend and it appears that when they relocated to Cheltenham in the mid 1920s, part of the course was taken over by the now defunct Sandridge Golf Club and part was set aside for industrial development. It wasn't until the mid-1930s that General Motors Holden (GMH) acquired a parcel of land to build their car manufacturing plant. There is a picture in the Victoria Golf Club history by Don Lawrence of GMH Managing Director, Sir Lawrence Hartnett visiting the site early during the establishment of the plant. The interesting point being that Hartnett's chauffeur is in the background holding a few golf clubs. 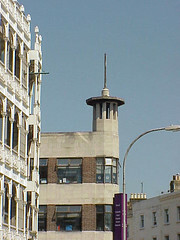 The factory opened in 1936 and originally had a revolving spotlight on the top of the tower, however it was removed within a few years due to the outbreak of WWII. GMH no longer manufacture cars here so a lot of the site has been re-developed into Portside Industrial Park. 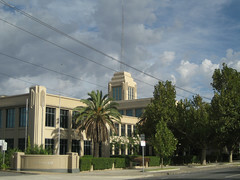 The original administration block remains in Salmon St, one of Melbourne's great art deco buildings. I think this very impressive art deco balcony and verandah is bolted onto an earlier version of the hotel. 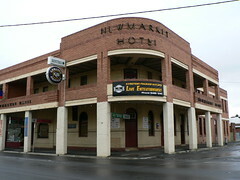 This is the Newmarket Hotel. "Kynetons Premier Nite-Spot" or so the banner on the front reads. Off to the right there is an extension in deco style but the underlying structure of the main part of the hotel looks older to me. According to the Australian Heritage website, there was a Newmarket Hotel in Kyneton in 1870. 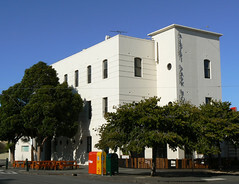 The site relates the story of the bushranger Ned Kelly having appeared in the local Court House on charges of robbery under arms was held at the Newmarket Hotel at police expense for three weeks after the charges were withdrawn while money was found to pay for his return home to Greta. If this is the same Newmarket Hotel where Ned stayed in 1870 then it must have had a makeover 50 or 60 years later to create the magnificent Newmarket Hotel in this picture. 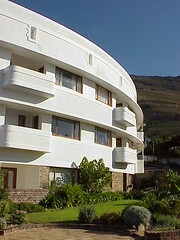 While attending the 7th World Congress on Art Deco in Cape Town during 2003, a few of us hired a minibus and a guide to do a few touristy things and do a bit of sightseeing along the cape. Naturally we got him to stop if we spotted a deco building on the way and by the time we got to the African Penguin colony at Simon's Town, he was pointing them out to us. Seaforth Court was one of his nominations and I think he did very well. It is quite majestic the way it curves around the street. There is very little decoration. An interesting arrangement of bricks around the vents just below the roofline. Ribbed columns and porch at the entrance and a horizontal band on the small open balconies. The ground floor has been finished in brick which contrasts against the white of the bulk of the building. As is usual in a sunny climate, the windows are shaded by a concrete eyebrow running the length of the curved facade. I don't know if we recruited a deco disciple that afternoon but I can imagine him pointing out some deco highlights as he ferrys tourists around the cape. 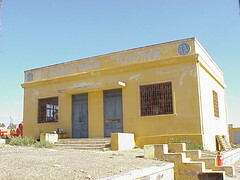 Agip (Azienda Generale Italiana Petroli), the Italian petrol company, has this great little building on the outskirts of Asmara in Eritrea. Babel Fish tells me it is a chemical laboratory, but I reckon I could have had a stab at that without the help of a translator. It is fair to say that the building is little more that a rectangular box but the steps leading up from the driveway have a certain style to them. 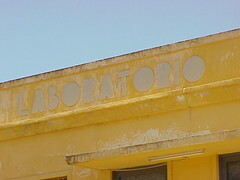 Of course the standout to me is the stylised lettering spelling out Laboratorio Chimico. Back in May, I wrote about Marewa, the suburb created the land rising around Napier as a result of the earthquake that struck the east coast of New Zealand in February 1931. Today, I am showing you a similar house in Kaikoura on the South Island. I suspect these types of houses are dotted throughout New Zealand. I love their simple elegance and bright colours. This one is blue with square stepped-backed sections and very simple right-angle geometric decoration at the roofline on each corner. You will notice also the shallow eyebrow above the windows running around the house, linkng up with the rounded porch. The Brighton & Hove City Council website states that Shoreham Airport is the oldest established airport in the UK and so they should. 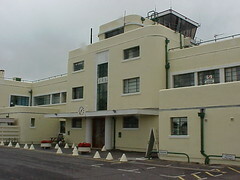 Originally established in 1910 it became the Brighton, Hove and Worthing Joint Municipal Airport in the 1930s. The art deco Grade II listed terminal building was designed by local Brighton architect Stravers H Tiltman and officially opened on 13th June 1936 by the mayors of the three municipalities. 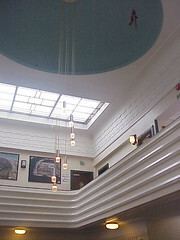 Today it is the Shoreham (Brighton City) Airport and well worth a visit for any deco fan. If you like aviation then so much the better. 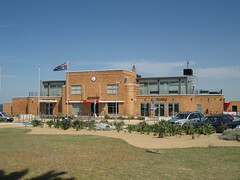 The Visitor Centre provides information and tours of the airport. Inside there terminal, many of the original deco features survive. I seem to remember an episode of Poirot where the suspect ends up on the roof of the airport and falls throught a nice deco skylight window! Sorry to spoil the ending. The bar/restaurant offers a great view of the runway and has an airside observation area. I've read that you can fly to France from Shoreham. I wonder if they have any DC-3s in the fleet? Now that would be something special. I spotted this building in Grafton St, Dublin and took an instant shine to the polygon shaped tower topped with a flagpole. I also like the use of brick columns between the windows as a contrast to the white stone used on the rest of the facade. This website has a great picture of the building from the 1930s and this website reveals a bit more about the building's former life, especially that it was once Nobletts Sweet Shop. In the recent years the ground floor shop has been a Newsagency and I presume the upper levels have been used as offices. But I keep getting drawn back to the tower. I wonder how big it is inside and what sort of a view of Dublin it offers.